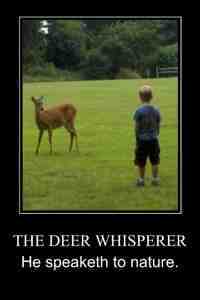 In the past, I have called him the The Deer Whisperer. 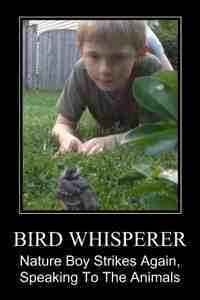 Now I think he answers the calls of downy-fluffed birds. My son has an uncanny knack of being "one with the Animal Kingdom." He's not quite Grizzly Adams, but he has a talent. At the tail end of last week, my boy brought me out to the front yard to show me the little robin he found. The tell-tale signs our li'l friend was a robin was from a smidgen of orange on his feathery chest, and his mama who was occasionally squawking from a nearby fence. We got a quick and up-close peek, but knew not to touch or even feed (despite our natural instinct to want to). We'd been paying attention to Jennifer Keats Curtis when she came to Eagle Cove School during our Earth Week to talk about Animal Rehabilitators. My Nature Boy asked if I knew of any "Wildlife Protectors" to call, and aside from Jennifer (who was probably busy with dinner right about then), we didn't. So we relied on Mother Nature and Mama Robin, and gave our baby fledgling some space, peace, quiet, and privacy. A half hour later I came back to look for our li'l fluff ball, and he was nowhere to be seen. Safe, no doubt under a bush or with his mama. As it should be! And this mama had a warm spot for her li'l human buddy who has an outdoor eye and a way with wildlife! Pictures from my camera, using the Motivational Poster app for iPhone to create the above images.